The Magellan spacecraft mapping Venus with its imaging radar went into a safe mode at 7:11 p.m PST Friday, according to a Magellan Project spokesman at NASA's Jet Propulsion Laboratory. The spokesman said that the spacecraft shut down its high rate telemetry to Earth, turned off its radar and halted the stored mapping sequence when an onboard computer detected errors in an uplink command sequence. Those errors were attributed to the ground control computers which create the uplink sequences. 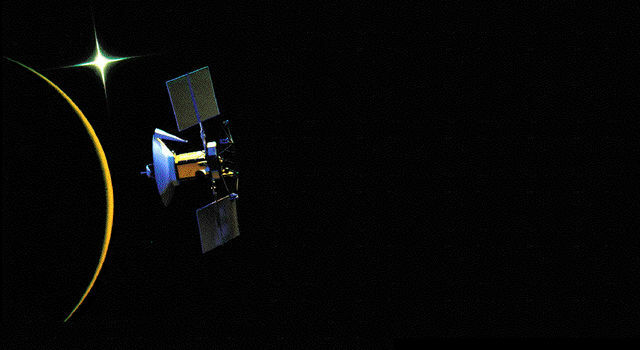 The spacecraft's computer system went into a safe mode with the high-gain antenna pointed to Earth. Communication with the spacecraft was not lost and flight controllers said that three mapping orbits would be lost before mapping of the Venus surface resumes early Saturday. It was the second loss of mapping incident in eight days. The Magellan signal was lost for 40 minutes on Nov. 15. There were two earlier losses of signal in August.